What Do Fathead Minnows Eat? For many years, fathead minnows have been used largely as bait or as food for other aquarium fish. Recently, they are beginning to be regarded as aquarium pets themselves. They also go by the name rosy-red minnow (admittedly a nicer name than fathead). Because they are growing in popularity, it is important to know how to feed a pet fathead minnow. Fathead minnows are native to North America. However, they are becoming more widespread because they are often released into the wild when they are being used as bait. 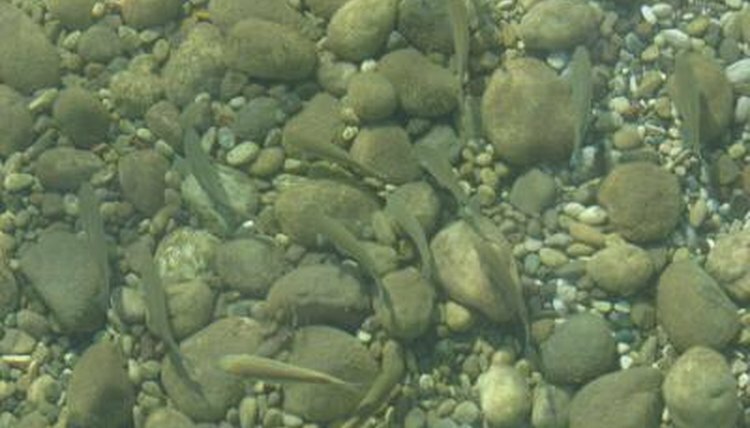 Fathead minnows can live in habitats that are poor in quality, and will thrive under low oxygen, high temperatures and muddy waters. Fathead minnows can be kept in aquaria quite easily. They can be raised on nearly any diet, regardless of whether the food moves or not. Fathead minnows are voracious predators on things like brine shrimp, which are relatively easy to come by. They will also eat fish food in either flake or pellet form--although it is a good idea to not sprinkle the food on top, as they prefer to eat the food as it is sinking in the water or when it is lon the bottom. In nature, they will eat detritus (decomposing matter on the bottom of a pond, lake or stream), and small water insects. The name fathead minnow originates from its appearance. Generally, minnows are simply small fish. The largest fathead minnows only reach 10 cm, which is relatively small for a fish. Fathead minnows also appear to have very fat heads, which are larger than their bodies, and often what appears to be a swollen snout. Male fathead minnows will grow large tubercles on their snout during breeding. Fathead minnows are well known for producing Schreckstoff, which is a substance that is contained within the skin cells of the fish. When the skin of the fathead minnow is scraped, as might happen in a predatory attack, the Schreckstoff is released into the water. This substance serves as an alarm to other fish in the area that a predator has made an attack, and allows them to swim away unharmed. Chemicals that are formulated to be released into the environment (such as pesticides) will run through a battery of tests designed to determine whether the chemical is toxic to wildlife. The fathead minnow is a species that the U.S. Environmental Protection Agency recognizes as an acceptable surrogate species on which to conduct toxicity tests. If fathead minnows show a response to the chemical, it is assumed that other vertebrates in the ecosystem will show similar responses. Fathead minnows are easy to raise in the laboratory (due, in part, to their widely varying diet) and are frequent breeders and so are favored as a test organism.